Does Your Dog Need a Hearing Test? There's a lot of buzz in dogdom about selective hearing. This somewhat derogatory term applies to dogs who haven't yet mastered the recall, among other things. Unlike people, though, dogs don't reason and purposely decide to turn a deaf ear. A combination of distractions, doing what they were bred to do, and often ineffective training makes some dogs appear stubborn. Instead of yelling at the top of your lungs, whisper, "cookie" and he'll instantly become a better listener. But what if your formerly responsive dog is suddenly tuning you out? It's possible he may be experiencing hearing loss. Whether it's an easily remedied wax build-up or treatable ear infection, old age, or a congenital (present at birth) or acquired hearing loss, you'll need to do a little detective work to learn if your dog is hearing-compromised. You can perform a simple at-home hearing test to get an idea of the degree of loss, then consult with your veterinarian for a professional Brainstem Auditory Evoked Response or BAER hearing test, which looks at brain activity caused when the ears register sounds. Dogs listen to things we never hear. Second only to their phenomenal sense of smell, a dog's hearing is amazing! They can hear the bodily movements of termites in a wall and hear their owner's heartbeat from the other side of the room. In fact, dogs' superior hearing has played a major role in thousands of years of success as a species. In the wild, if a dog or wolf couldn't hear the beating heart of their prey from a fair distance away, they would have no chance to catch it, thus wouldn't eat that day. The sense of hearing is measured in frequencies or pitches, and humans, depending on their age, can hear sounds beginning at 20 hertz and ranging up to 12,000-to-20,000 hertz. In contrast to our seemingly limited spectrum of audible sounds, at least by canine standards, dogs, depending on their breed and age, can hear in the range of 40,000-to-60,000 hertz. Human and dog ears share similar anatomy of the middle and inner ear with an eardrum, which is known as a tympanic membrane and little bones in the inner ear called ossicles that vibrate sending signals to the brain via the auditory nerve. But, of course, dog ears are larger, and they also contain at least 18 muscles that control the pinna, or ear flap. These muscles allow them to fine-tune the position of the ear canal, thus localizing sounds and hearing more accurately from farther away than a human ever could. Consequently, dogs with upright ears such as German shepherds, for example, have more sensitive ears, or better hearing, than, say, a bloodhound who has floppy ears that hang down over the ear opening. While it's normal for dogs to be born deaf with closed ear canals, some dogs will remain deaf. It seems that congenital deafness is mostly genetic and, according to Stanley Coren, PhD., is associated with certain coat colors. A normal pup's ear canal opens 10-to-14 days after birth. If a puppy doesn't seem to hear by the time he's three weeks old, a BAER test should be administered, because it may take several weeks before a veterinarian or breeder recognize it. 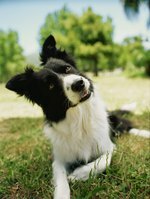 At high risk of congenital hearing loss are dogs with a white coat with spots, or piebald, pure white, roan, and merle. A classic example of the piebald is the Dalmatian breed where 22 percent are born deaf in one ear, 8 percent are deaf in both ears, and 30 percent are affected with some level of a hearing deficiency. What can affect hearing temporarily? Dirty ears can affect hearing. Like people, dogs can get a wax build-up in their ears that impacts their hearing. Consult with your vet for the best ear cleanser to do the job at home or have your dog's ear cleaned in the vet's office. Ear infections can also cause a partial loss of hearing and often can go undetected until the infection blocks off a portion of the ear. Ear infections are treatable, and a trip to the vets and some aftercare at home will usually resolve the issue. What can cause a loss of hearing? Ear inflammation or infection, which can be caused by seasonal, food, or flea allergies, and promotes the growth of infectious bacteria and yeast. Blunt trauma to the neck, skull, or other body parts; for example, being hit by a car or kicked by a horse. Tumors that are cancerous or benign since the mass takes up space and exerts pressure on the inner ear structures. Glandular disorders like hypothyroidism contribute to abnormal nerve function. You return home and your dog doesn't respond to the opening of the door or greet you as he always has in the past, but seems to respond only when he hears the vibrations of your footsteps on the floor. Your dog does not respond when you call his name, nor to other familiar sounds. Other pets in your home suddenly seem to be able to sneak up on your dog, encroaching on his personal space. When you stand in another room, out of sight, and make loud sounds like whistles, jingle keys, clap hands, or bang pots, your dog does not turn his head toward the sound. Many veterinarians offer the BAER test in their clinic, or they may refer you to a veterinary neurologist who administers the test. Also, mobile services are available; for example, Advanced Veterinary Mobile (Judy Pawlusiow, DVM) which operates in New York, New Jersey, Connecticut, Pennsylvania, New Hampshire, Massachusetts, Vermont, and Rhode Island. Originally developed for humans, the BAER test measures how your brain processes the sounds you hear by detecting electrical activity in the cochlea and auditory pathways in the brain, in a similar way to an EKG, which detects the electrical activity of the heart. For dogs, it's the same test, and it takes about 10-to-15 minutes to complete. It's administered by placing tiny electrodes under the skin in the front of each ear, the top of the head, and one between the shoulders. It is rare that a dog exhibits any pain during this procedure. Ears are tested individually with a stimulus click produced by the computer directed into the ear with a foam-insert earphone. The computer records the waveform responses consisting of peaks numbered with Roman numerals, starting at 1, indicating variations of hearing, to flatline, which indicates no response, or deafness. After the test, you get a printout of the results showing the recorded waveform; test results are confidential. Is there any treatment for hearing loss? Hearing aids for dogs have been developed after years of research, but the cost is prohibitive for many dog owners. Also, keep in mind, the chances of getting your dog comfortable with a foreign object in her ear may be slim to none in the case of many dogs. However, smaller dogs seem to tolerate hearing devices better than larger dogs. Unless a dog was born deaf and has become used to living without hearing, a dog with acquired deafness will not be as responsive as a dog who can hear, for obvious reasons. However, other senses do kick in, and a deaf dog's sense of touch intensifies. After the initial confusion, many deaf dogs live an excellent quality of life with families sensitive to their limitations. In many cases, a dog with total hearing loss will thrive; masters of adaptation that they are! Is it Ok for Dogs to Play Growl? Why Do Cats Have Little Pockets on Their Ears? What is the Effect of Electronic Pest Repellent on Dogs?